Suffolk Naturalist: Where does the time go? Great post, well done on the humane rat control. I look forward to hearing about your local bat population when the weather warms up. Thanks Libby, and thanks again. When I moved here at the start of October, I did have a male Common Pip that used fly past the window giving out a lekking call. We have a small, old chapel down the road one way and a bigger church in the other direction, which I want to have a good nose round. Will keep you posted. Hi, I too have a rat problem, and live in a very rural place. I caught 7 in a live trap and released them miles away. They were immatures. Now though I havent caught one for ages as the adults will not go inside the trap. They are happy just to scrat around it! Can I give you a tip when moving them. Rats are incontinent. This is how they follow their own runs in the dark etc. You do not want to get this dripped on you or your car. I lift the cage into a plastic storage box lined with newspaper and a clip on lid. This then goes into the car boot for transport. I always wear gloves and keep the rat at arms length too. Love hearing about your new surroundings. 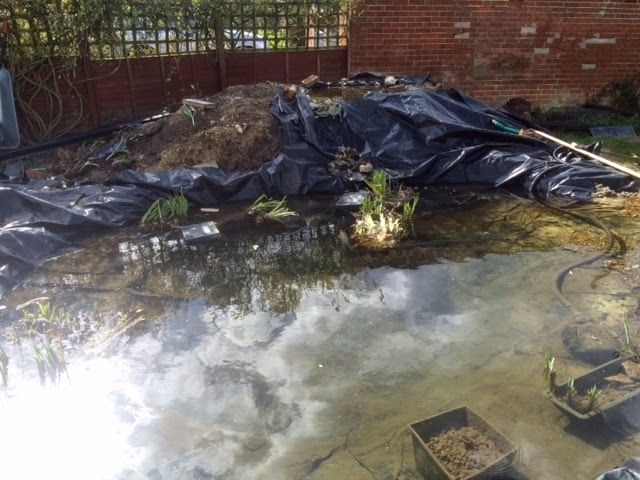 Looking forward to seeing the progress of your ponds. Our bluetit box is used for roosting every nigh but so far no sign of nesting. So far no activity with the sparrow box nor the robin box.